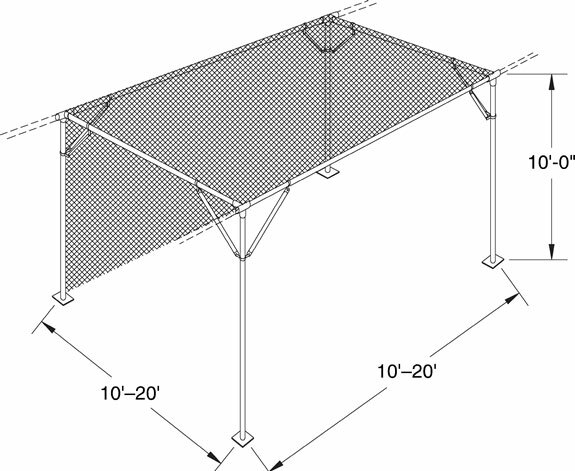 choose an option 10 ft. x 20 ft. 60 ft. x 100 ft. 60 ft. x 80 ft. 60 ft. x 60 ft. 40 ft. x 100 ft. 40 ft. x 80 ft. 40 ft. x 60 ft. 40 ft. x 40 ft. 100 ft. x 100 ft. 20 ft. x 100 ft. 20 ft. x 60 ft. 20 ft. x 40 ft. 20 ft. x 20 ft. 10 ft. x 100 ft. 10 ft. x 80 ft. 10 ft. x 60 ft. 10 ft. x 40 ft. 20 ft. x 80 ft. 100 ft. x 120 ft.
Our sturdy commercial shade structure will protect your valuable product from scorching and windburn while reducing water requirements. It features straightforward assembly, expandability and is built tough with 2.5" x 12 gauge, galvanized steel for years of trouble free service. Available in 10', 20' or 30' widths x 20' standard blocks, we also offer custom configurations to meet your existing layout. Frame: 2-1/2" diameter x 12 ga. Important Note: This product takes 3-4 weeks to manufacture and ship.